Chicken Wings is probably one of my favorite snacks and I’m pretty sure we have a lot of fans out there. Chicken Wings are perfect for game night, parties and movie time, they taste amazing and with the recipes that we are going to share, they are going to get healthier as well. Generally, with these chicken wings, we invite a lot of oil/fat and the especially the deep fried wings that are way too heavy on the calories. Having a recipe to cook these wings inside the air fryer is really going to help you keep your weight on track and avoid unnecessary calories. This is the best part about using an air fryer, you can enjoy your favorite foods and keep a track of your calorie intake at the same time. Cooking wings in the air fryer would require one tbsp or no oil as the fat from the wings are enough to cook them well. This makes my Air fryer one of the best investments that I ever made as they help me make healthier food choices and still enjoy my favorite dishes like French Fries and Chicken Wings. The fat in the wings take some time to separate and once that happens, you can see all the oil dripping from the wings and fallen on the cooking basket. Overall we are simply in love with how well the air fryer cooks the chicken wings and if you love your chicken wings and are looking for a healthier way to cook them then an Air fryer is the best investment you can possibly make. So let’s get into the simple ways that you can cook your chicken wings inside the Airfryer! 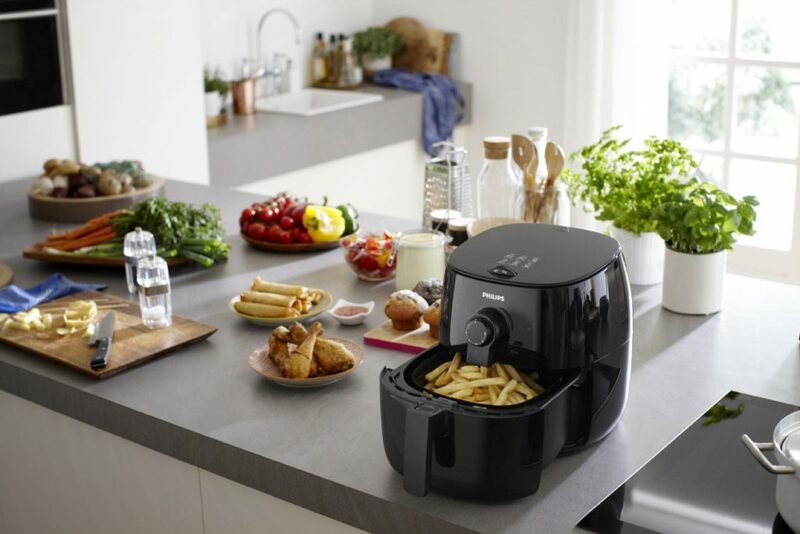 Are you looking for the Perfect Airfryer? Then check out a few recommendations that we have! How to cook the Perfect Chicken Wings inside the Air Fryer? 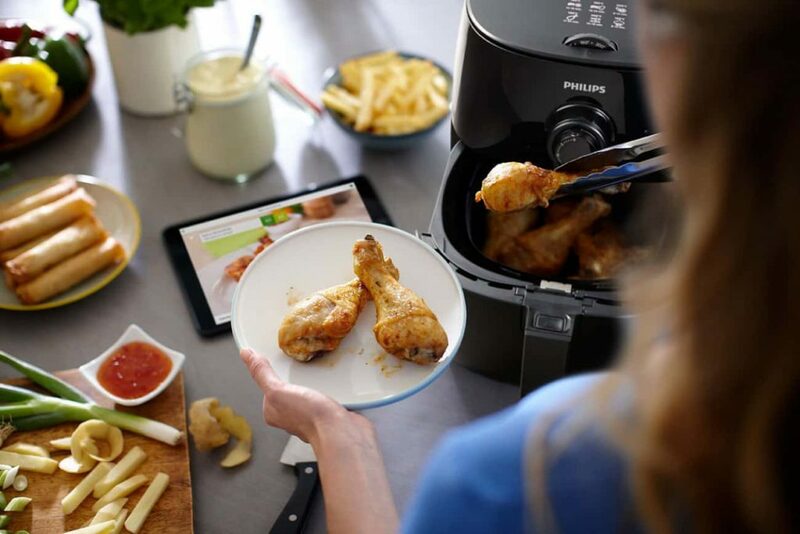 Cooking chicken Wings is pretty easy inside an Airfryer and if you are having the Philips Air Fryer then you might not find the need to remove the food to turn it around again and again in order to cook it evenly from all sides. However, most of the airfryers, need you to remove the cooking basket during the cooking time so that you can turn the chicken wings being cooked inside in order to ensure that they cook evenly from both the sides. Usually, cooking the chicken wings for around 30 minutes inside the air fryer does the trick. If your chicken wings are still cold then you will probably take 30 minutes overall to get them cooked properly and evenly. While cooking the wings, you might want to cook it slowly for the initial 20-22 minutes and then bump up the temperature and cook it at a higher temperature like 390°F. This way you give enough time for the chicken wings to cook properly from the inside and they all crispy on the outside. 1. Spray the cooking basket or tray with some oil so that the chicken wings do not stick to the basket. If you are interested in using more oil, then you can just marinate the wings in 1-2 tbsp of oil. 2. Now, put your chicken wings inside the Air fryer depending on the capacity of the Fryer. Make sure you do not overload the fryer as that would just result in some uncooked or unevenly cooked wings. 3. You do not need to preheat the air fryer, just insert the cooking basket and let the chicken wings cook for 25 minutes. Make sure the temperature is around 350°F for the initial 15 minutes and the last 10 minutes you can bump it up to 390°F so that the outside of the chicken wings get crisp. 4. You might need to take out the cooking basket in between in order to toss the chicken wings so that they are cooked evenly on both the sides. 5. Your chicken wings should be ready after 25 minutes and you can do a taste test and see if you wish to keep it a bit longer to make the outside skin crispier. 6. 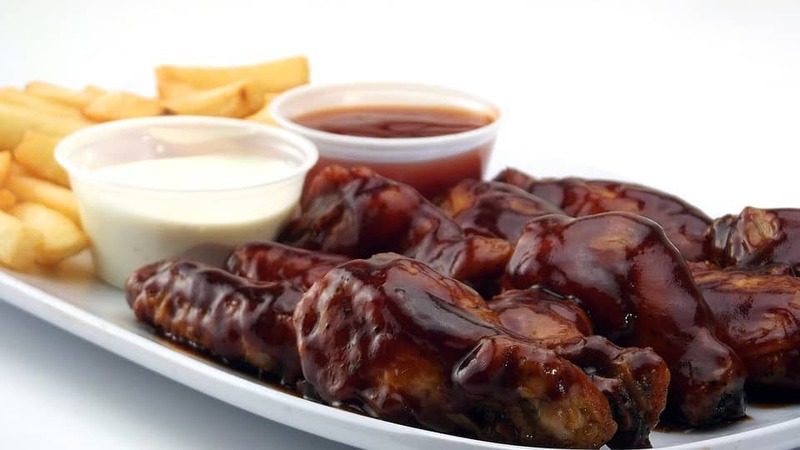 Once the wings are all cooked, you can use your favorite sauce and toss it in them. You can go extra spicy or sweet with the sauce based on your liking. Something that I like to do while making my chicken wings is to season it with some spices before putting it in the air fryer. You can use the combination of any spices you like but I usually use some oregano, oil and chili powder to give it that extra spicy taste. Once you season it, you can put it in the air fryer and cook it using the steps that are mentioned above. After the chicken wings are cooked, I toss them in some barbeque sauce so that they get that sweet and spicy effect together giving me some amazing tasting chicken wings. This is one of my favorite ways, however, I have seen people coat the chicken wings with flour and other dressing before putting it in the air fryer and the choice is completely yours. You can choose whatever dressing you think is right and cook your chicken wings in them. How to reheat cooked chicken wings? If you want to eat some chicken wings later then you can make extra and store the chicken wings in your refrigerator, as reheating them in the air fryer is super easy. Set the air fryer temperature to 350°F and heat up the chicken wings for 5-7 minutes. Your chicken wings are ready to be consumed. If you are wondering if the air fried wings taste as good as the deep fried chicken wings then let me clear that up for you, they taste the same or even better. They actually taste really good as they turned out to be juicy on the inside and crisp on the outside, just the way chicken wings are supposed to be. If you are into fitness or just want to make healthier dishes then the air fryer is the perfect investment. You can enjoy foods like chicken wings, potato fries, chips without having to deep fry in oil. The Air fryers are probably the best way you can reduce your oil consumption and at the same time eat everything you want to so go ahead and check out our air fryer recommendations. The Philips air fryers are all over the place, however, we have reviewed few more so do check them out and let us know what you think about them. Do you like chicken wings? Isn’t this the easiest way to cook your wings without it getting all oily and messy? Let me know your thoughts in the comments down below!